You have looked at what seems to be every last house in Maine and yet still haven’t found one with everything you want and need from a home. 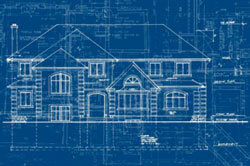 The logical next step is designing a house of your own that does have and fit it all. Think of all of the various amenities, accents, or building styles that you have loved in your friends, family, or neighbors’ houses and write them down, ideally taking or locating pictures of them. Compile all of your pictures, articles, etc. into a binder. After gathering together the binder of ideas, make a list of all of the things you “have to have” and place it at the front of the book. If having a double sink in the master bath is a must for you, put it down. You most definitely want a Craftsman style home or a large outdoor living space? Write each of these things down, categorizing the needs from the wants. This makes your estimates and discussions with your local contractor go more smoothly and lends a better idea of what you are looking for in your home. Find a reputable contractor using the internet or a reliable referral and schedule a meeting to discuss your ideas. The clearer of an idea you have concerning what you want in a home, the more accurate of an estimate your contractor can provide. Explain your needs in a home and listen to what your contractor has to say about how to find solutions for them. Develop a scheme, site plan and design with your contractor that best fits your needs. Experience is essential at this stage, so choose wisely and monitor progress periodically to ensure your home is what you have in mind. There are many steps in building your home, from design plans to building permits, so be sure to hire a reputable contractor to ensure that your path to your dream home is as smooth as possible.